Once again I am reminded of “To Every Man His Chimera,” one of the darkest prose poems of Charles Baudelaire. The previous time Baudelaire’s unlucky men came to my recollection, trudging through the dust carrying upon their backs an enormous chimera as heavy as a sack of flour or coal, was while reading Joko’s Anniversary (perhaps my finest reading experience of 2013, along with the many Cortázar‘s short stories I’ve had the pleasure to read). This time the occasion is my recent acquisition of Goya : Caprichos, Desastres, Tauromaquia, Disparates (1982, Fundación Juan March), a complete set of all the engravings by Goya. 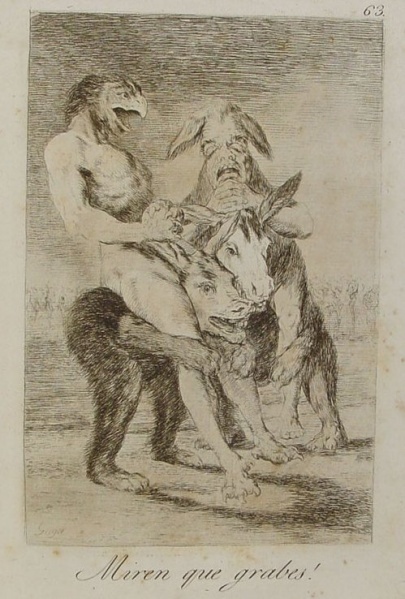 “Look how serious they are!” is number 63 from 80 prints of the Caprichos and it depicts “two demons taking a little exercise, and riding on grotesque beasts. One demon has the head of a bird, the other of a donkey.” (source) The pack animals, the grotesque beasts, look like bipedal donkeys with faces half human, half donkey. Creatures with the head of a bird are frightening. The wattle!, the comb! The reverse motif, creatures with the feet of birds, has been employed in Un priape marchant sur des pattes de coq, with a far less frightening — yes, even ludicrous — effect. This entry was posted in Uncategorized and tagged 19th century, Baudelaire, chimera, creature, Goya, grotesque, hybrid on December 23, 2013 by jahsonic. Charles Baudelaire by Étienne Carjat (ca. 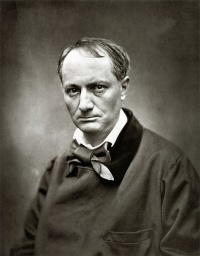 1863) is a photographic portrait of Charles Baudelaire taken by Étienne Carjat. The photo was published in a widely distributed series entitled Galerie contemporaine, littéraire, artistique. In the portrait by Carjat, his face and his eyes are contorted as if in a terrible rage ; the whole face seems drawn upward and downward in a kind of convulsion ; and the aspect, one confesses, shows a degraded type as if all the vices he had never committed looked out of his eyes in a wild revolt. This entry was posted in Uncategorized and tagged Baudelaire, photography on October 23, 2013 by jahsonic.